Matthew Efird discovers innovation and efficiency in the middle of California's drought. Flying over the central San Joaquin Valley on approach to Fresno Yosemite International Airport, it felt a little bit like arriving in a war zone. Given media coverage of the great California drought–the Golden State's latest and, perhaps, nastiest dry spell ever–visitors might imagine devastation. From above, the valley floor cast a light brown and dusty hue. Yet, sizable swathes of green gave good evidence that agriculture was still alive, if not totally well. Matthew Efird, 38, farms in the San Joaquin Valley, a few miles south of Fresno. Despite the drought, his almond and walnut orchards and grapevines are lush and productive, a blessing of water pumped from aquifers 200 feet below his farm and aggressive water conservation practices. "We've been proactive in investing in irrigation technology," says Matthew, a fifth-generation producer, who partners in Double E Farms with his father, Russel. "Our entire operation has been micro-irrigated for 10 years," he says. A second source of water for the ranch comes by way of irrigation channels. But that avenue has dried up, literally. Parts of the ranch haven't seen a drop of surface water since 2008. There is no minimizing the notion that water is a big deal here. Not when many of the 40 million Californians think twice about taking a daily shower. Local water boards suggest every other day might suffice. Here, homeowners collect $2 per square foot from the California Department of Water Resources to replace traditional lawns with drought-tolerant sedum, mugwort, salvia, California buckeye, and other dry garden plants. California agriculture is feeling a greater pain. Surface water deliveries to agriculture were reduced 8.7 million acre-feet (326,000 gallons per acre foot) last year due to the drought. Forty-four percent of the state's irrigated farmland received no surface water in 2015. Producers fallowed 565,000 acres, most of it in the Central Valley. The 450-mile-long Central Valley where Matthew farms is a $28-billion-a-year agricultural machine (the San Joaquin and Sacramento Valleys form the Central Valley). Large-scale dairies, rolling cattle ranches and 400 varieties of nut and fruit trees, vines, vegetables, row crops and forage are produced there. Fresno County is the nation's most productive, with output valued at $6.437 billion. Most of the surface water that irrigates California crops begins as mountain snow, measured over a normal winter in tens of feet. The craggy Sierra Nevada Mountains and its snowpack accounts for a third of the state's water. The snowmelt flows into reservoirs and is released into a vast network of irrigation channels and pipelines to farms and homes, and for fish and wildlife purposes. Importantly, that water also recharges the aquifers, including the one under Matthew's farm. In 2015, researchers couldn't find a snowball's-worth of snow anywhere in the Sierras. By one calculation, the Sierra hasn't seen such little snow in five centuries. "Proper irrigation management has become a real science," Matthew says. "We have our water usage down so accurately that if we are forced to make mandatory cuts in ground water pumping, I don't have even 5% to give," he says. Agriculture consumes about 40% of California's available water. Urban and suburban users take another 10%. The environment–water set aside for fish, birds and ecosystems–drinks the remaining 50%. "I hope the investments we've made in water-efficient technologies will be recognized in the event of pumping restrictions being enforced," he says. Well water has saved many farms. But it is a falling, and increasingly saltier, resource. Well water typically supplies about 30% of Central Valley needs. Today, it is more like 50%, and there are many more users of it. Matthew's wells draw water from a depth 50 feet greater than five years ago. Salt is a growing problem. "By only pumping ground water through micro-irrigation, we are seeing an accumulation of naturally occurring salts and minerals in the root zone," Matthew explains. "These salts are typically leached by rain water and surface water." He has seen precious little of either. The salts, plus warmer winters, have reduced his almond production. Matthew manages hard to keep ahead of the water curve. Irrigation water is applied directly to the berms where the roots can most efficiently consume it. He uses soil moisture probes. He contracts with a third-party for weekly measurements of moisture in the root zone. He's considering an infrared imaging system to gauge plant stress. The technologies give him data to calculate the soil's water-holding capacity, to monitor plant water uptake, and to fine-tune his irrigation scheduling. "We are fortunate that our ranches are located above an aquifer with fairly shallow and high-quality water," says Matthew. "We've been able to mitigate the drought to this point using our micro-irrigation systems." The sprinklers, or emitters, have cut his water use by at least 30%. It's an efficiency purchased for $1,500 to $2,000 an acre. Micro-irrigation gives Matthew the capability to fertilize his vineyards and orchards at the end of an irrigation cycle; the timing is important, because it reduces the leaching of nutrients applied to the root system. Moreover, he has cut his herbicide costs in half by primarily treating only the watered areas for weeds. Matthew has installed three solar electrical generation facilities to manage his increased pumping costs. "They offset one-third of our annual power usage due to pumping in a dry year and over 50% of our energy use in a year with average surface water availability," he says. Matthew has demonstrated innovation in the face of an environmental event he can't control, and he has searched for and discovered practices that make his farm more efficient. For those reasons, DTN/The Progressive Farmer named Matthew Efird one of the 2016 America's Best Young Farmers and Ranchers honorees. Ryan Dooley, senior vice president with Farm Credit West in Hanford, Calif., has high praise for Matthew. "Many operators are excellent production managers, but they lack skills when it comes to organizing, understanding and communicating their financial needs," says Dooley. "[Matthew] has demonstrated that he is a tremendous manager." The Efird operation had humble beginnings. At its birth, the family ran a few head of cattle, grew dryland crops and operated a general store. The farm eventually began to produce irrigated corn, cotton, sugar beets and alfalfa. As land values increased, Matthew's father, Russel, and his uncle, Jack, gravitated to more valuable raisins, almonds, walnuts, prunes and wine grapes. Matthew is vice president of Double E Farms. The ranch ground, once populated by cattle grazing rolling swales 6 to 7 feet tall, has been laser-leveled. Well-drained, sandy-loam soils support more than 1,500 acres of almonds, walnuts and grapes sold as raisins and for wine. Efird Ag Enterprises, Inc., of which Matthew is president, is the commercial operations branch of the farm. It includes a commercial harvesting arm with 2,500 acres under contract, a successful produce transport business and a business dedicated to shredding orchard prunings. Shredding is an act performed by truly devilish machines that consume branches up to 5 inches in diameter by way of whirling sets of steel teeth. Prunings disposal is labor intensive without such machinery. Matthew has over 60,000 acres served. "I felt a passion for production agriculture from a very young age," he says. Over time, he learned the ways of farm machinery and the function of the farm's shop. Through high-school summers with 110ÂºF days, he sweated the fine details of crop management. Matthew attended the California Polytechnic University San Luis Obispo after graduation, earning a degree in fruit science and a minor in ag business. With an "unwritten minor" in plant-protection science, he also earned a pest control advisor's license from the state of California. At Cal Poly, he managed the university's vineyard and spent time working for his Uncle Jim's vineyard management company in San Luis Obispo. "I was filled with his wisdom and advice," Matthew says of his uncle. "I was exposed to the ins and outs of his operations. I learned that being successful is not solely based upon know-how; just as important are the social interactions and networking." Matthew is a fellow in the California Ag Leadership Program, one of 24 who have embarked on an 18-month journey of personal development, leadership training and public speaking education. "I want to get my story out, let people know what we do and how we do it. I want them to know we take this responsibility seriously," he says. Community work is important to the Efirds. Matthew supports the local fair, 4-H and FFA chapters. He represented the interests of taxpayers by serving the local school board as chairman of a bond oversight committee that monitored renovations of the local high school. He currently serves on the executive board of the Fresno County Farm Bureau as treasurer. He is a delegate and the specialty crops director for Fresno County Farm Bureau on the California State Farm Bureau Federation Crop Advisory Council and House of Delegates. He also represents the energy interests of small- to medium- size agriculture operations at the California Public Utilities Commission. There, he is an executive board member for the Agricultural Energy Consumers Association. One of the more challenging production operations on the Efird operation is harvesting grapes for raisins. It is high-cost, high-risk work that led Matthew to mechanical harvesting. 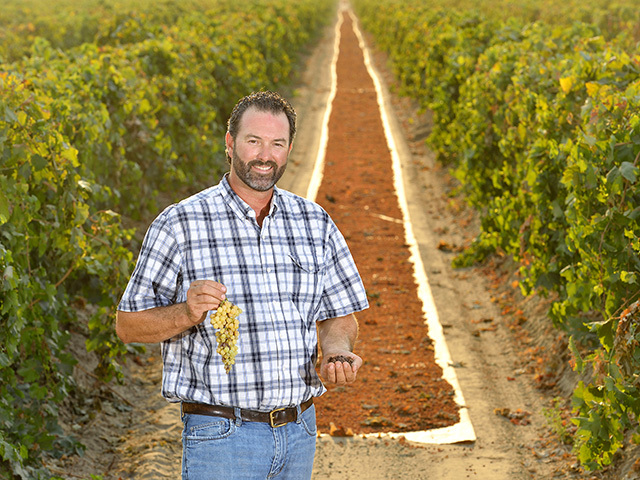 For many producers, the grapes-for-raisins harvest is labor intensive. Large crews of 50 to 100 workers pick individual bunches of grapes and place them onto paper trays laid down the length of a row. The grapes dry for 21 days. The paper trays are then rolled into bundles (known as a "burrito"). Another crew pulls trailers carrying wooden bins through the vineyards. Workers pick up the paper bundles and empty them into the bins. The hand-boxing crew would then collect the paper as they boxed, carrying it to the end of the row, where it was burned. Full bins are moved to a storage shed. Six workers dump each bin of fruit across a shaker to remove substandard raisins and dirt. The cleaned fruit is loaded back into the bins, onto a truck, and delivered to the processor. "Any opportunity we have to mechanize, we will take advantage of that," Matthew says. The minimum wage for field labor in California is $10 an hour and rising, and there is a chronic shortage of labor–and that adds risk to the quality and timeliness of the harvest. Mechanically harvesting grapes was an innovative game changer. The mechanical harvest begins when a labor crew severs 2-year-old fruiting canes with pruning shears. By cutting the canes, the stem attached to each individual berry dries and falls off the vine with the berry. Seven to 10 days later a harvester straddles the vine row, shaking the vine at a rate of 200-plus beats per minute. The fruit is transferred across a blower, a step that removes leaves and substandard fruit. The wrinkled green berries move over the row to a receiver. The receiver catches the fruit and transfers it onto a single continuous paper tray that runs the entire length of the row. After drying for an additional seven to 10 days, a pick-up machine straddles the dried fruit on the paper, picks up the raisins, shreds the paper (later incorporated back into the soil), removes dirt mixed with the raisins, and dumps the raisins into wood bins. The bins are loaded onto a flatbed truck and transported directly from the field to the processor. "Where this process would take 200-plus people to do the job, it now takes 10," Matthew says. "It still amazes me that this entire harvest process was reliant solely upon the willingness and availability of hundreds of people to work in the fields." The inherent risks of farming fuels Matthew. "I enjoy the feeling of overwhelming accomplishment and joy when a crop is finished being harvested, or the excitement and pride when a business risk pays dividends," he says. And, it's the way he intends to farm into the future. "We will continue to evaluate new technologies. We will harness the gains in efficiency and reduction of labor," he adds. "We need to continue to evaluate emerging markets for new crops. The sky truly is the limit if we are not afraid to look forward."